The couple, who attended the pontiff’s Un Muro o Un Ponte Seminary at Paul VI Hall, were also on hand so that George could be awarded a medal for his work with Francis’ Scholas Occurrentes, an International Organization of Pontifical Right that connects technology with arts and sports, according to its website. 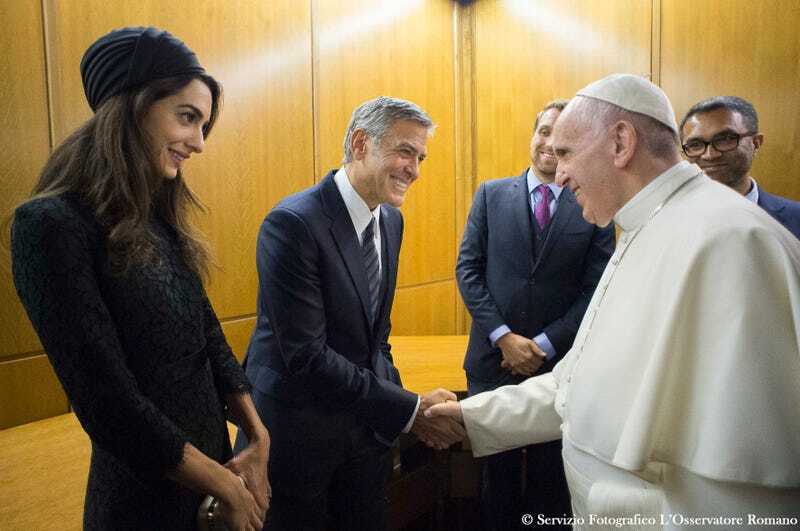 Salma Hayek and Richard Gere were also at the Vatican for the event, which really makes you wonder: Did Francis only take this gig for the star-studded hobnobbing? Amy Schumer, Kate Hudson and Goldie Hawn spent Memorial Day weekend lounging together in Hawaii. Click through their photos of the trip while playing the “Pleasant Beach” loop on your Nature Melodies app and splashing yourself with a white wine spritzer—it’s as close as you’ll get to having been there. Also: Kate Hudson reading bell hooks: A++.